Urban Decay Vice 2 Palette came out a few months ago and NAKED 3 shortly after that. I'm only now getting to my review of them. The colors in the palette were gorgeous and looked like colors that I would use. I especially loved the jewel-toned colors. While the colors look gorgeous in the palette, unfortunately it didn't translate when using it--at least on me. It was quite disappointing and after trying it out 2 times, I have given up and will put it into my blog sale page next month. 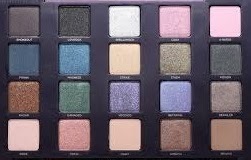 I have not been loving Urban Decay's eye shadows lately. While I know that many people love the new formulation, it doesn't work for me. I find that many of the colors now come out much, much darker when applied than what it looks like in the pan. I had also purchased NAKED 3. I don't know why except that I got caught up in the hype. I also had high hopes for it since it was more pink toned but it also didn't work out too well for me. Somehow, I just can't wear neutrals. I was so glad that I was able to give it away to a very good friend to use. P.S. Since I knew that I wasn't keeping these items, I used "good" pictures from Sephora instead of taking it myself. I prefer the Naked 3 for I like the colors more than the Vice 2. I have tried it and it really creates different beautiful looks.